You CAN have your cake and eat it, too. 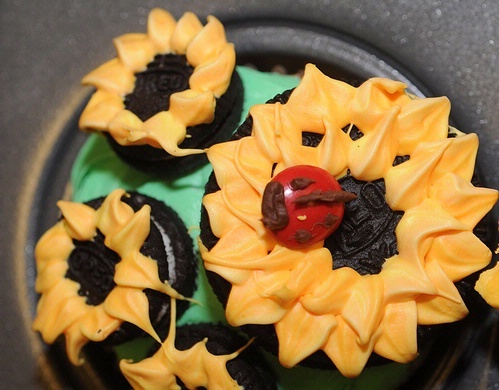 You can also "have your BUG and eat it, too." Even if you're not into entomophagy. 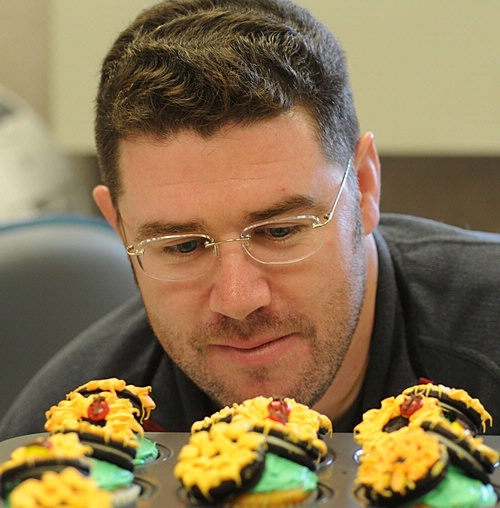 When Randy Veirs, executive assistant to Lynn Kimsey, chair of the Department of Entomology, brought cupcakes into the office that wife Faye made, atop each cupcake perched a little ladybug. Little as in "M&M" size. Little as in a real "M&M." Little as in "Wow! How creative!" Faye is a marketing and development assistant at the UC Davis School of Law. A native of Hawaii, she moved to California in 2000. She plays clarinet and ukulele. In fact, as teenager, she taught ukulele at the Roy Sakuma Studios in Hawaii. Husband Randy plays the trumpet in the UC Davis Symphony. Lately Faye has been reading a fun-filled book, "Hello, Cupcake!"